Having only ever walked up to the Chattri Memorial in the past, I was ready for a hike through the mud in my suit in order to be present at the inauguration of the new Patcham Down Indian Forces Cremation Memorial. 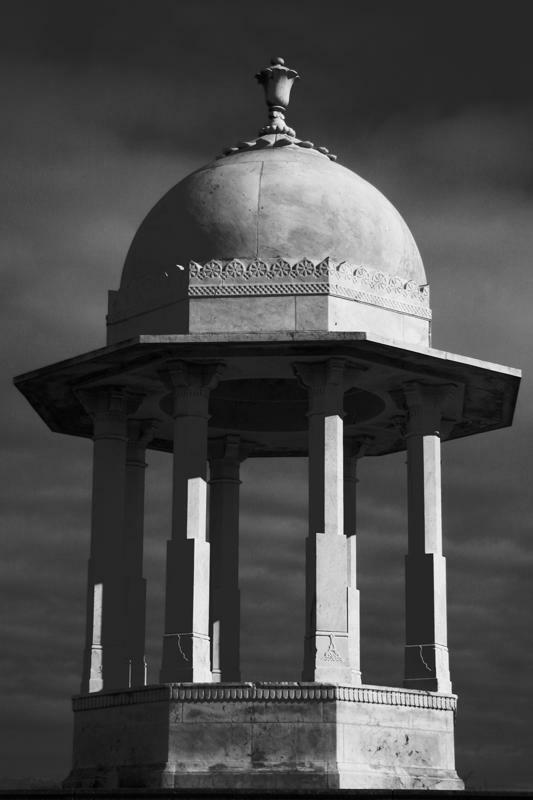 The Chattri itself was erected as a memorial to the Indian soldiers who died in Brighton during the First World War. It is situated on Holt Hill, about one mile to the north of Patcham, and was designed by an Indian student staying in London, E. C. Henriques, under the supervision of Sir Samuel Jacob. Sicilian marble was used as the principal building material. I was wondering how the High Commissioner of India, Lord Lieutenant of Sussex, High Sheriff of East Sussex, Mayor of Brighton & Hove, Member of Parliament for Hove and the many other local dignitaries who were scheduled to attend would actually get there. I was pleasantly surprised to discover that a track is opened up across the muddy fields for such occasions – so suits stayed spotless. Sunday 26th September 2010 was the date of the inauguration of the new memorial, a Portland stone screen wall bearing the inscription “IN HONOUR OF THESE SOLDIERS OF THE INDIAN ARMY WHOSE MORTAL REMAINS WERE COMMITTED TO FIRE”. The 53 Hindu and Sikh soldiers who died in Brighton were cremated on a ghat (funeral pyre) on the site and their names are all recorded on the new memorial. 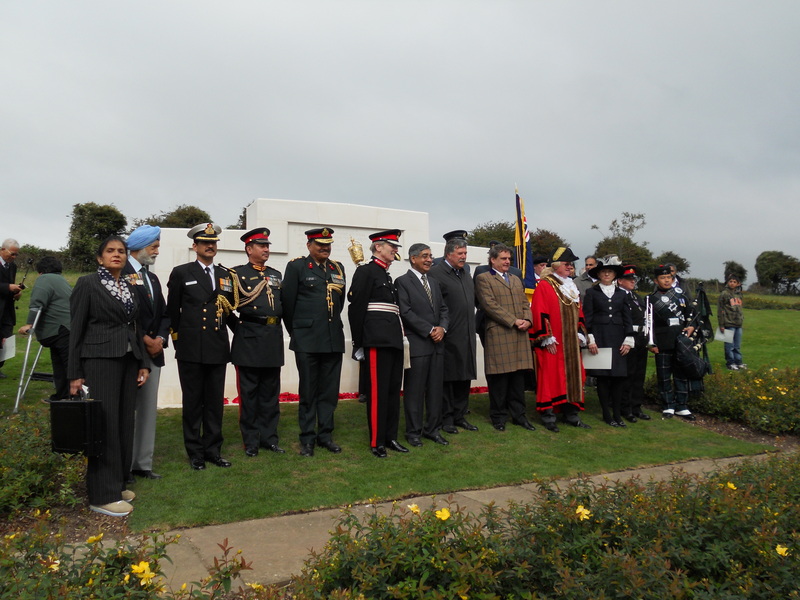 The project brought together the Commonwealth War Graves Commission, Brighton & Hove City Council and the Chattri Memorial Group whose dedicated Chairman, Davinder Dhillon, has been campaigning for this fitting reminder for around ten years. I have no doubt that it was worth the wait. At the ceremony, I met Kevin Bacon, Curator of Photographs at the Royal Pavilion, who told me about the Indian Military Hospital gallery which is currently in place upstairs at the Pavilion. Paintings and photographs tell the story of the Indian soldiers who were wounded on the Western Front and then treated at the Pavilion, Dome and Corn Exchange. The Royal Pavilion is always worth a visit but this exhibition made my latest outing there all the more relevant. An annual remembrance service is held at the Chattri Memorial and, sadly, I have yet to attend. Sunday 12th June 2011 is firmly in my diary though and I shall certainly be there to pay my respects.